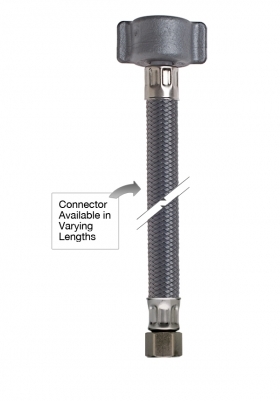 FlowTite® PVC or Braided High Performance connector with 3/8" comp. nut x 1/2" reinforced polymer IPS nut. For Lav/Sink connection. Connector Lengths available: 12" , 15" , 20" , 24" , 30" , 36". Connector Lengths available: 12" , 15" , 20", 24", 30", 36".